Afghanistan 3-154 (Mohammad Shahzad 68, Shafiqullah 51*, Tanwir Afzal 1-19) beat Hong Kong 8-153 (Mark Chapman 38, Waqas Barkat 32, Shapoor Zadran 2-27, Mohammad Nabi 2-27) by seven wickets. Hong Kong managed 153 runs for the loss of eight wickets in 20 overs and Afghanistan piled up 154 with seven wickets remaining and 12 balls to spare. 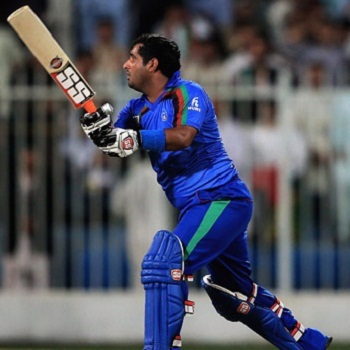 Mohammad Shahzad (Afghanistan) was announced ‘Player of the match’ for his aggressive knock of 68. The ICC World T20 – 5th match, First Round Group A, was held on Tuesday, March 18, 2014, at Zahur Ahmed Chowdhury Stadium, Chittagong. Earlier, Jamie Atkinson won the toss for Hong Kong, opted to bat first and lost the first wicket without a run on board. He joined in next with Waqas Barkat and started consolidating the innings. Atkinson was the quickest of the two and took the total to 42 before he was gone for 31. Mark Chapman dropped in next and carried on the momentum with Waqas Barkat who became the next victim at 102 for 32. Chapman was the fifth batsman who went back to the pavilion after the addition of 15 runs to the score for 38. The incoming batsmen were unable to accumulate sufficient runs and Hong Kong reached 8-153 in 20 overs. Shapoor Zadran, Hamza Hotak and Mohammad Nabi were the highest wicket takers with two each whereas Dawlat Zadran got one. Afghanistan surrendered their first wicket at 14 when Asghar Stanikzai associated with Mohammad Shahzad who was scoring most of the runs. The score was enhanced to 69 as the first became the next casualty for 13. Shafiqullah appeared in the park next while Mohammad Shahzad attained his fifth T20 fifty on the 41st delivery. The third wicket partnership was dismantled at 116 when the latter was caught by Irfan Ahmed off Haseeb Amjad for 68 from 53 with 3 towering sixes and 6 fours. Shafiqullah took charge of the situation, dispatched 3 big sixes in the 17th over and went past his maiden T20 half century with a boundary. He remained unbeaten for 51 off just 24 comprising 3 sixes and 5 fours as Afghanistan hammered 3-154 in 18 overs. Tanwir Afzal, Haseeb Amjad and Aizaz Khan were the only wicket takers with one wicket each. Afghanistan won the match convincingly with a hefty margin of seven wickets and became rich by two points.